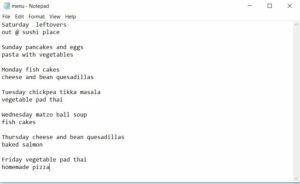 I’ve been menu planning for a good decade and this is my general process, I tried to make it helpful but it might just be wordy instead. I will warn you: this method works for me and it’s very likely that it doesn’t work for you, but that’s okay! You’ll find what works for you with trial and error! If you’re new to menu planning the most important thing to know is: Don’t worry if you go off-menu. Life is never going to be exactly like our plans so be flexible and be realistic with yourself. I often juggle around the meals or skip making something in a given week so you have my permission to mess up. It might be really hard when you start planning because you probably don’t have a stash of tried and true recipes yet. Recipes that you will reliably eat, that are easy to make, with things on hand and at a price point that suits your life. I have a LOT of these. Probably over 50. Inserting meals like that in your planning absolutely key. If you already have a list of them, you’re going to find this a lot easier but if not, don’t worry! Just make sure when you find a recipe you love that you keep it in a list that you can refer back to easily. What is your goal: Saving money? Reducing salt? Special diet? More vegetables? Quick meals? How many meals and for how many people? How often can you really stand leftovers? When and how long do you want to spend prepping and cooking? When and how often will you shop? These questions don’t tend to change for most people week to week so basically once you figure out how to make your planning work for your lifestyle, you won’t have to think about them too much. This is because we eat the same breakfast every morning but add in breakfast if you need. Then, because I don’t like to eat the same thing more than twice a week, I pick 4-6 “main” recipes. My personal goals are to eat a fairly vegetable heavy diet, plan for 2 people including lunch that will travel well and can be warmed up, and that I want to do most of my cooking on a single day and very little in between except on Friday night when I make a special meal (usually a homemade pizza). Sometimes I have something in mind or I want to use certain ingredients so there’s where I start, I list off the ingredients I want to use and the recipes I already want at the bottom. I look through my recipe stash next. Then I look at the folder of bookmarks of recipes I saw but didn’t want to make at the time. After that, I visit foodgawker and use the search tool. As a very last step I will start randomly googling but usually I’ll be able to come up with enough recipes before that point. There’s a lot of ways to get variety in your menu without making yourself too all over the place. You can have a variety of flavors, textures, types of preparation, or just a different vegetable that is the basis of each recipe. 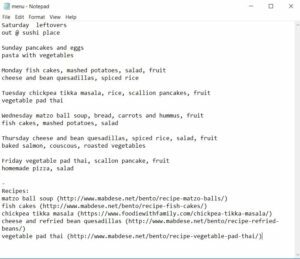 Quick tricks for this are using a template where each day is a different preparation (Monday is stew, Tuesday is burgers, etc.) OR picking a culinary locale and theme-ing the week around it. I’m going to use this week’s menu planning to show you an example. This week I want to make matzo ball soup. So I will can rule out a second soup in my menu but consider thick curries or stews since they have a varied enough flavor and texture for me. Chicken soup contains chicken so I might want to make a second chicken dish if I want to roast a whole chicken OR I could decide that I want to make sure I don’t make a second chicken dish for variety, depending on how I feel about finances and preparation. If I want to save more money or cook less, using the whole chicken throughout the week will help. There’s a logic to this as you could make 5 soup in one week but no matter how different they are you’ll probably burn out on soup long before you eat it all. So if I already have a dish with pasta, maybe I should look at a rice dishes instead. If I had two dishes with potatoes, I probably don’t want to make mashed potatoes as a side and should choose something else instead. If you hate eating the same thing over and over, this type of texture and taste variety should be baked in to your menu. A note about new recipes: I avoid making more than one new recipe at a time and try to make a very small batch of new recipes in case it’s not that good. At worst, you can make it again if you like it. If you make five new recipes, the odds are high at least one of them will be a complete miss and you will be really unlikely to follow your plan if your food isn’t great. The beauty of these five recipes is that they’re all tried and true recipes for me, they can all be made ahead of time, and they reheat reasonably well. If you’re very picky about quesadillas not being made ahead of time you can even make them at the last second, taking only 5 minutes to do so. I filled in the gaps with eating out, simple night-of dishes like pasta, and some leftover things we have. At worst, I might choose an extra main recipe if there’s more gaps. You’ll notice this list is basically things don’t need to be cooked at all or can be made ahead of time with minimal effort. You can always choose to make more complicated sides but I don’t like creating more work for myself. If I had less variety of main courses I might make more complex sides but otherwise adding fresh fruit and vegetables to a meal is way easier. The last step is looking at the recipes and listing out ingredients that you need. This usually takes me 5 minutes and I reorder them at the end to line up with how the store is laid out so I can shop quicker and easier. Always be sure to check your pantry for staples you might be missing because there is nothing more frustrating than getting home to make food and finding you are missing the most basic of ingredients! The whole process from start to finish takes me about 25-30 minutes but then I just forget about it. I refer to the list all week to keep me on track and it frees up space in my mind for other things not worrying about what’s for dinner. 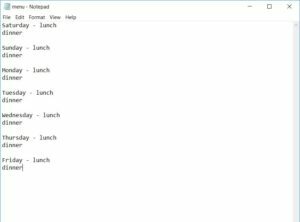 So that’s how I menu plan. Maybe it was helpful or maybe not. If you have any specific questions about this method or if something wasn’t clear, let me know!